Libraries, bookstores and the broader public have been celebrating June as National Lesbian and Gay Book Month since the early 1990s. 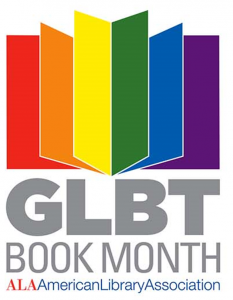 In 2015, ALA’s Office for Diversity, Literacy, and Outreach Services (ODLOS) and the Gay, Lesbian, Bisexual, and Transgender Round Table (GLBTRT) continued the nationwide celebration with GLBT Book Month, to recognize the authors and writings that reflect the lives and experiences of the gay, lesbian, bisexual, and transgender community. The creativity and passion of librarians in creating displays amazes me. Walls and bookshelves are covered in hearts, rainbows and sparkles; colors streaming from the ceiling; information and inspiration spotlighted wherever space is found. There are programs for all ages and all interest levels. The atmosphere of welcome, joy, love and PRIDE radiates beyond the four walls. There are some incredible examples when you search Pinterest for ideas. Every display during any month is a great opportunity to include works by all authors and topics and not to shy away from adding materials that highlight queer content. But the reality is that June is when many libraries decorate with inclusive displays and rainbows. June is also when ALA’s Office for Intellectual Freedom sees a spike in reports chronicling complaints about LGBT displays and requests to take down displays. More common is when LGBT displays are outright denied approval to be crafted to avoid controversy or because administrators don’t agree with the content. Censorship of library displays is very common because few libraries have a policy or guidelines in place that protect librarians who build these displays or how to address concerns when they come from external or internal sources. Please let the ALA Office for Intellectual Freedom know if this happens to you. We can help! We can provide talking points, help with press interviews, provide letters of support for your board, publicly support your library on social media, coordinate with local allies to gather support, and offer a listening ear for questions and emotional venting. We will protect your confidentiality. Even if the display doesn’t come down, it’s helpful to know when these situations happen so we can build more support and education for the library profession. If Drag Queen Story Hours (DQSH) aren’t the right step for your library, that’s ok. There are lots of programming ideas for Pride Month. Libraries have been very successful with film festivals, crafts, author visits, pride picnics, read-outs, photo booths, and interactive displays. A few things to consider when planning your programs: 1) Do you have support from your colleagues? It will help you feel more confident. 2) Does your library have a programming policy that addresses how complaints should be handled? “LGBT” was the most cited reason for challenging library materials and services in 2017. Since 1990, the ALA Office for Intellectual Freedom has recorded 122 titles that have been challenged for including LGBT content. More than one-third of these titles have been challenged more than once. The Intellectual Freedom Blog GLBTQ category chronicles a lot of the current events, challenges, and issues that we’re seeing in libraries and schools. Censorship and challenges to library programs are just as important to report as a book challenge. These are events organized by skilled professional library staff and by censoring them, not only does the community suffer, the staff suffers. The chilling effect of censorship lowers our professional morale and creates a stressful work environment. There are a LOT of librarians who have had successful experiences with pride programming and displays. They offer a wealth of tips and advice. Here’s an abbreviated list of some blog posts and articles from our amazing colleagues. ALA’s GLBT Round Table has a great toolkit; “Open to All” is designed for libraries of all types and sizes and offers practical tips and resources on purchasing materials, developing programs and promoting partnerships with other organizations. “Our goal is to give library staff at any library a starting off point on serving this community. Those who are unfamiliar with the GLBT community and their needs often ask us where to start. This toolkit will help point them in the right direction,” said Peter Coyl, 2016 GLBTRT Chair. On June 4th, Saint Paul Public Library (SPPL) posted a press release on its Twitter feed and was immediately swarmed with replies. On behalf of the American Library Association’s Office for Intellectual Freedom, we express our gratitude for upholding the ideals of respect, inclusion, and equality for all people and celebrating intellectual freedom in your library. By crafting programs that create a joyful and engaging environment for everyone, you have proven to your community that SPPL welcomes all people, from all backgrounds, and difference is not something to be feared. The library’s mission — “We connect people in Saint Paul with the imperative and the joy of learning through a lifetime” — is clearly exemplified in this series of programs. You’ve not only connected the library’s mission with the story hour, you’ve tied together the “We Belong Together” (SPPL’s inclusivity campaign), the ALA Library Bill of Rights, and the state of Minnesota Pride Month celebrations. By increasing the visibility of materials and services for everyone in your community, SPPL is establishing the library as a welcoming and inclusive center with free access to all ideas, without censorship or discrimination. By providing library users with the freedom to explore an array of viewpoints, libraries help them develop into thoughtful citizens. We extend our full support to the library staff of the Saint Paul Public Library, who work to organize and promote a diverse range of services for the community without shying away from potentially controversial subjects. We encourage their continued excellent service to all the members of their community, whether straight or gay, who have made a home in Saint Paul. By providing diverse programs and defending the freedom for community members to attend or not attend, you sent a powerful message – that, in this country, everyone has a place at the library. In January, Broome County Public Library announced a Drag Queen Story Hour at its library in Bingingham, New York. When I read its Facebook post in defense of the event and aim for the community to “freely explore the entirety of the world,” I printed out the post and pinned it to the bulletin board in my office. I read it out loud at a staff meeting for everyone who works at the Office for Intellectual Freedom. Libraries celebrate and defend the freedom to be who we are — differences and similarities and everything in between. Hey! Thanks so much for featuring us and Deja Brooks! I believe ours if the first library in the Midwest to host DQST. It has been widely popular and we’re in our second year. One ask: would you credit the Lawrence Public Library (not the Lawrence Journal World) in the photo of Deja Brooks and perhaps include our website in case anyone wants to see more of what we do every year-round as well as Pride Month? We’re: lplks.org. Of course! thanks for reaching out.